This week's North American PlayStation Store update has arrived, bringing with it new games, old games and games based on old things from the future. 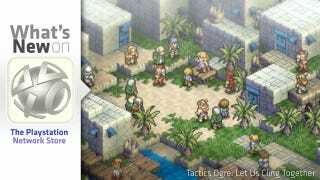 Highlights include the PSP remake of Tactics Ogre: Lets Us Cling Together, the debut of Telltale's Back to the Future on PlayStation Network and Acceleration of SUGURI X-Edition. And for those of you in the throes of The Tester withdrawal, the reunion show featuring the cast of The Tester 2 is now yours to enjoy. Here's what's new on the digital front for the PlayStation 3 and PSP. Backpack Pack ($5.49) – "The Light" by Common, "Ms. Fat Booty" by Mos Def and "Get By" by Talib Kweli.